2016 Skoda Superb 2.0 TSI 280 4x4 DSG review | What Car? The Skoda Superb is a fine car. So fine, in fact, that in our 2016 Car of the Year awards it scooped wins both in estate and hatchback form. There’s good reason for this; in our favoured trim, the mid-spec 2.0 TDI 150 SE Business, it delivers a huge, well-finished cabin, a decent ride and good equipment levels alongside competitive pricing and running costs. However, if you fancy something with more performance, would a faster petrol version still make sense? To find out we’re trying the most powerful engine in the range, a 276bhp 2.0-litre turbocharged petrol. It comes with four-wheel drive, which should make it handy on frosty mornings, and a six-speed DSG dual-clutch automatic gearbox, and it's available in either of the upper trim levels: SE L Executive or Laurin Klement. This version is the SE L Executive, for which you’ll pay £31,020 before options. That sounds quite a lot when you consider that a top-of-the-range BMW 330i M Sport auto is only £3000 more, and much of that additional cost will be cancelled out by better resale values. What's more, the BMW comes with aggressive M Sport bumpers and a sporty interior to differentiate it, whereas this Superb looks much the same as any other in the range. It’s well appointed, though, featuring an 8.0in infotainment screen, sat-nav, heated front seats (including electric adjustment for the driver’s seat), dual-zone climate and adaptive cruise controls. What’s the 2016 Skoda Superb 2.0 TSI 280 4x4 DSG like to drive? Despite the added power, this version is just as easy to drive as the other Superbs we’ve tried. The engine’s smooth power comes in early from just 1500rpm, and there's plenty of mid-range punch so it’s effortless to drive in town or on the motorway. It’s only when you floor the accelerator pedal that the engine’s additional performance really becomes apparent. There’s a momentary delay before it picks up, but then it pulls hard right to the limiter and delivers searing pace; from 0-62mph it’s neck and neck with the BMW’s time of 5.8sec. It’s always refined, with a smooth but pleasingly hard-edged note when driven hard. In town the automatic gearbox works well, changing smoothly as you potter about. When you need a burst of acceleration it kicks down smartly, and our test car had the optional steering wheel-mounted paddles for changing gear manually. Skoda offers mechanical suspension as standard, but we recommend the optional switchable adaptive dampers fitted here. Set them in Comfort mode and enjoy the Superb’s soothing ride, spoilt only by the occasional thud over sharp surface imperfections. When you need a bit more control, selecting Sport mode firms the suspension and adds weight to the steering. It certainly makes for better control and less body lean, but the Superb never feels as well tied down or fun to drive as the 330i M Sport or equivalent Audi A4 TFSI 2.0 252 quattro. That said, it is surefooted, with plenty of traction in slippery conditions, and when it does run out of grip, the front tyres wash wide in a controllable fashion. Of course, the trade-off for this Superb's performance is reduced efficiency, so it’s no surprise it is costlier to run than the versions we’re used to, but even against the BMW it isn’t great. It's five tax bands higher for benefit in kind than the 330i thanks to poorer CO2 emissions, so a 40% tax payer will pay £500 more a year in company car tax. Also, while the average fuel economy of 39.8mpg looks reasonable, it’s some way off the 47.8mpg BMW claims for the 330i auto. On a stop-start run through London traffic, we saw an average of just 24mpg on the Skoda’s trip computer. What’s the 2016 Skoda Superb 2.0-litre TSI 280 4x4 DSG like inside? It’s just like any other Superb SE L Executive. That’s no bad thing, because the driving position remains excellent, with comfortable, part-Alcantara electric seats that have lots of adjustment. Up front there’s loads of space for anyone tall, but it’s the vastness of the rear accommodation and boot that sets the Superb aside from the smaller 3 Series or A4. If space is your top priority, there really is nothing bigger in this class. Don’t assume that choosing the Superb means getting a cheaper-feeling interior, either. While it might not look as special inside as an Audi A4, the Skoda is very well finished and comes with lots more standard equipment. 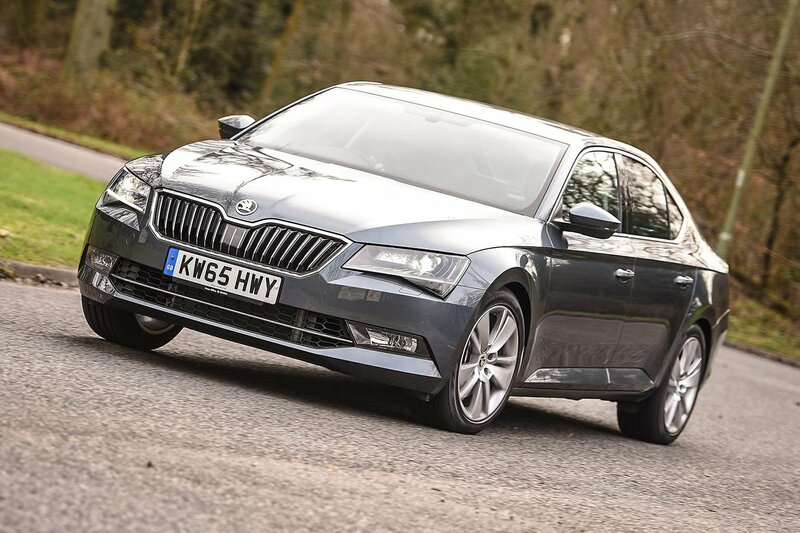 We really enjoyed driving the Skoda Superb 2.0 TSI 280. It’s very quick, comfortable and well equipped, but still offers the practicality that makes the cheaper versions so appealing. However, if you want a petrol Superb we’d still recommend you stick to the smaller 1.4 TSI 150 petrol, or better still, go for our pick, the 2.0 TDI 150 diesel. Both make far more sense in this type of car when you look at what they cost to buy and run. Or if it’s the performance and sportiness you are after, the BMW 330i M Sport or Audi A4 2.0 TFSI 252 quattro are both more fun to drive. Crucially, when you look at long-term running costs and resale values, they’ll be cheaper to own as well, which is why, as tested here, we’d choose either over the Skoda.